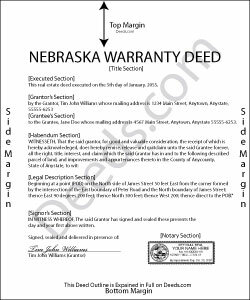 In Nebraska, real property can be transferred from one party to another by executing a warranty deed. These instruments are accepted, but not statutory in Nebraska, and are commonly used for sales of residential real estate. Warranty deeds provide a high level of protection for the buyer (grantee). In addition to the covenants of a grant deed as set forth at Neb. Rev. Stat. 76-206, (that the grantor has good title to the estate in quantity and quality which he purports to convey), the grantor asserts that the title is free of any encumbrances (except for those stated in the deed); and that the grantor will warrant and defend the title against the lawful claims of all persons, even if the claim originates from a time before the current grantor owned the property. A lawful warranty deed includes the grantor's full name, mailing address, and marital status, and the grantee's full name, mailing address, marital status, and vesting. Vesting describes how the grantee holds title to the property. Generally, real property is owned in either sole ownership or in co-ownership. For Nebraska residential property, the primary methods for holding title are tenancy in common and joint tenancy. A grant of ownership of real estate to two or more persons is presumed to create a tenancy in common, unless a joint tenancy is expressly stated (Neb. Rev. Stat. 76-118). As with any conveyance of realty, a warranty deed requires a complete legal description of the parcel. Recite the prior deed reference to maintain a clear chain of title, and detail any restrictions associated with the property. The deed must meet all state and local standards of form and content for recorded documents. Sign the deed in the presence of a notary public or other authorized official. Both spouses need to sign the deed to release any marital rights, regardless of whether or not the spouse holds a direct interest in the property. For a valid transfer, file the deed at the recording office in the county where the property is located. Contact the same office to confirm accepted forms of payment. This article is provided for informational purposes only and is not a substitute for legal advice. Contact an attorney with questions about warranty deeds, or for any other issues related to transfers of real property in Nebraska.